Christmas music is playing in the office as I blog these Christmas mini sessions. What a great season so far with more to come. Loved having snow in a few of the shoots too! Just in time for Christmas !! HELLO, what do I give to the person who has everything? Only a few more left !!! Purchase the gift card in full and use the session whenever you want! NEW Email Sign up option NO More #FOMO! There are some new additions to Click's Website and Fb page to always keep you in the Know! I've now added an EMAIL SIGN UP OPTION so that you no longer miss a sale with Click. 'The CLICKED IN Newsletter' is back. The Email sign up button is both featured on my website home page on the very top of this blog page with a link and on facebook to the left hand side of your screen, right, on the website. I promise I will not spam you or fill your inbox with useless info but I will send you deals and specials occassionally and keep you in the know! Would love your feed back and what kind of tid bits you'd like to see in the newsletter. And for those that subscribe to RSS feeds Click is now there too so you don't miss out on a blog post. There will be no more #FOMO with Click!! I knew by the way Shelley described the type of shoot she wanted that we would hit it off right away. Even though this was a mini maternity shoot I couldnt help but keep shooting and shooting. Lifestyle shoots are still my favourite. I had such a wonderful morning last month following her and her beautiful son around the market and then hanging out at home. A shoot to capture just the 2 of them before they welcome a new little member to the family. HAPPY NEW YEAR! IT'S 2017! It's time to take a look back over 2016 and say THANK YOU! 2016 brought forth so many new changes, opportunities and growth, both personally and professionally. Professionally, I rebranded with the help and great mind of Jen Ross with The Brand House. She looked deep and helped bring forward a brighter, shinier new website and look for CLICK. Showcasing the Portraits/Lifestyle side or Commercial/Corporate side separately. I couldn't be happier with the current clean look nor feel like it could represents me better. 2016 I also decided to take the plunge into having studio space. Shared studio space located in Kitchener, with my gracious studio sister Sylvia Pond. I'm so thankful to you for this opportunity. I cant wait for the new concepts that I have floating around in my head to become reality in the studio this year. 2016, Click was nominated for the Reader's Choice Awards again and even though we didn't make the top 3, I'm honoured to have made it to the top 10 photographers for KW out of more than 160+. Thank you! Click introduced for the first time Christmas Minis and with the help of designer Andrea Utter with Buttercup Design we had so much fun with the unique sets. I love this girl! There is nothing like a stylized shoot! Give me pretty and staged and Ill shoot it all day long! In total Click had the honour of doing 170 shoots with both returning clients and new ones. A real mix between lifestyle shoots and commercial corporate shoots. Professionally for Click I look forward to more fun in the studio with some new ideas on the horizon. Our sunshine returning for more beautifully lit urban family shoots. Updating the almost 1 year old new website with 2016's images. Offering more surprise specials throughout the year. More newborns, more interiors more families and more corporate/commercial shoots! It's always awesome to see how Click continues to grow and develop each year. Can you believe I've been doing this now for almost 13 years. Time truly does fly when you are having a fun! I don't often share a lot of my personal life but it's a new year and things are a changing. Personally, oh personally. Man 2016 what a ride! It feels like a blur. Always forever trying to find that evasive balance between work and home life. Am i right? I'm so thankful to my clients for their continued support as I try to find it like any other mom/entreprenuer. In looking back over my personal Instagram feed for 2016 for reference for this blog post, (which eventually becomes a coffee table book using chatbooks program) Im reminded of everything that happened. And to be honest, it looks like it was a close tie between life and work. Busy and busy! ha! Man were we busy. To start the year off we threw a huge 13th birthday celebration for our twin girls with 60 of our/their closest friends and family, a huge blast it was! I cut my hair all off again, Ha! We finished renovating the kitchen, the basement and my office, took our girls on a surprise trip to New York City. Dug deep into some relationships that needed some extra attention, love and healing. Experienced vulnerability, read some great novels. Tried wine and paint night, rock wall climbing, a Selena Gomez concert, a Cirque de Solie show, Family WE DAY, a Colour me Rad run, hot Yoga (now Im hooked) and a crazy fun girls weekend escape to New York City in October. In 2016 I also watched, supported and got to participate with my husband as he began beekeeping. Odd Man Out Honey. We also both decided it was time to put more effort into our marriage and make us a priority. 18 year this past year baby! We hiked the Bruce trail and started weekly hot yoga together on top of our regular Tuesday night date nights. We cottaged with family and friends again and look forward to this every year. We watched as our girls became more independent going off to far away camps and diving head first into the teen age years, with sleepovers, dance competitions and friend life. We welcomed our first beautiful niece into the world. Boy we love her! We also welcomed my nephew Kai from Japan to Canada who's here for a year to experience a North American education and has surprised all of us with how well he has adapted. I said goodbye to a beauftiul human being/momma/wife/friend after her long battle with cancer. Sue you are thought of and remembered all the time. In August I finally decided that fitness should be a forethought and not an afterthought in my life after being inconsistent with it for years and lost 18lbs!! (Im wondering if there's a connection to me loosing 18 lbs and being married exactly 18 years this year?) Crazy how that weight can creep up on you. New beginnings and confidence all around with this victory! Im gonna be real with you 2016, cause being authentic is ok right? Professionally you were awesome! But personally, you were exhausting and it's no wonder I crashed and got sick in December. The sunshine will be returning and 2017 will be a new from all the experiences and gifts brought forth from 2016. I'm a huge believer in that each experience leads to the next and we are constantly being guided. I have been pretty quite over here the past few weeks of 2017 but I think it's been a really good thing both personally and professionally to take a break and breath. To put your oxygen mask on and step back and look at what has been and then start to get excited about whats to come both creatively and mentally. With me having a creative profession I think being quiet can be a very good thing. (even thought this fast mind of mine tends to argue that) I also believe that pausing and reflecting is also a good thing for posterity. In 2017 my hope is to continue to honour my self care routines in order to continue to be my most creative best self. Someone mentioned to me this year that they think my style is growing and shifting and I hope that it is shifting to be more authentic and emotive. Thank you for letting me share openly. Everyday you allow me into your worlds trusting me to capture you and your loved ones. I'm so thankful to you all for this and hope to continue to do it for years to come. Thank you 2016! With love and gratitude and hope that your 2017 will be a beautiful blend of work and play and real moments. Ive had the honour of capturing this family's story since Jen and Todd got engaged. Im so lucky that I get to hang with them and their little girls every year and capture their awesomeness! What an awesome idea! A Barcar! Glenn hired Andrea with Buttercup Design to redesign this incredible Airstream. And you have to check it out! Team Building, Wedding Reception, Backyard party? Hello! 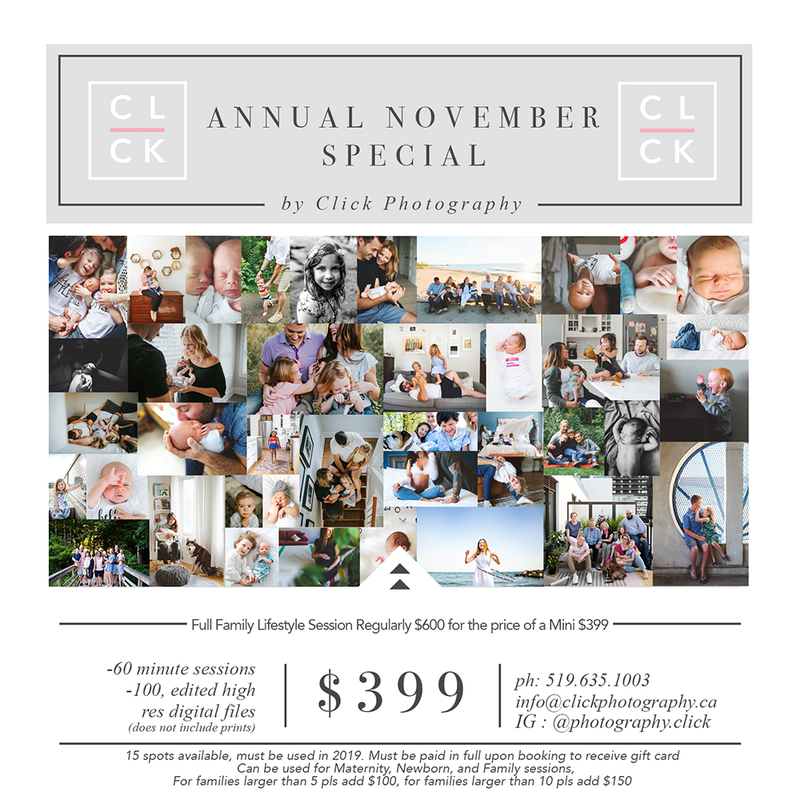 If I have missed crediting you please email me at info@clickphotography.ca and I will be sure to update. I could shoot Buttercup Designs Interiors all day! So excited that i got to see inside her creative space at the Coach House. Such a great office space! Andrea I cant wait for more projects together! Pottery shown by Jaclyn Ryan and Natalie Prevost . Live plants by the amazing Tina with Living Fresh . If I have missed crediting anyone in these photos as you see your art shown here please email me at info@clickphotography and I will update and credit your work! There is nothing more exciting than watching your client relax and trust you as a shoot unfolds. When they really begin to shine and you capture them in a truly real relaxed form. Stephanie, you rocked your unplugged headshots and let your light shine. I'm so happy I could do these for you!